Pink and gold. Is there a girlier, prettier combo out there? In the case of Dior Cruise 676 Nail Polish, I think not. Dior Cruise 676. Just look at that pretty pink. 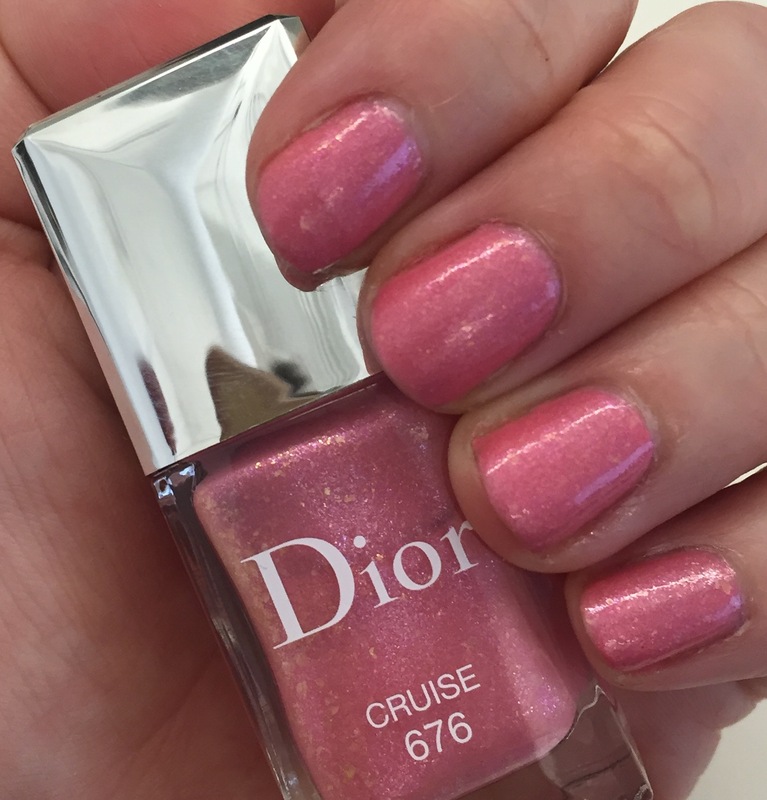 Dior Cruise is one of those colors that you see and think, "Well, it's probably okay." Then you put it on and BAM. Your world gets rocked. The mid-tone pink actually becomes a bit darker on the nail, especially if you use more than one coat. But what really sets it apart is the shimmery finish and the addition of multidimensional yellow gold glitter flakes. The glitter lends just enough sparkle for this to become something more than just another pink polish. Check out those gold glitter flakes! Coverage is completely opaque in two coats -- it's actually almost a one coater, but there was a bit of patchiness that completely disappeared with coat two. This polish also glides on effortlessly with a smooth finish -- it's not gritty at all, even with the glitter in the formula. A closer shot of the bottle. You can really see the gold glitter flakes in this one. I've always loved the top of the Dior polish bottles with the engraved CD logo. My one complaint pertains to all Dior polishes, and that's the size of the brush. I've always thought it's just a bit too wide for most nails -- and I'm speaking as someone who doesn't have small nails to begin with! There's always a bit more cleanup for me with Dior polishes than I find I have to do with other brands. The Dior polish brush has always felt a bit too big for me. Another shot of the oversized Dior polish brush. 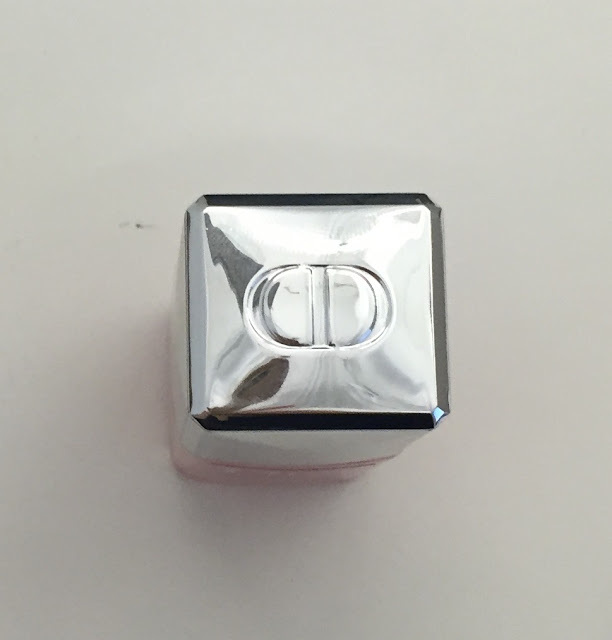 All in all, if you're looking for a pink polish with a little pop, Dior Cruise may just be right up your alley. Just pink about it. Dior Cruise 676 Nail Polish retails for $27 at dior.com. LOVE that shade of pink!! I don't splurge on polish too frequently anymore, but this looks like a winner! This is a stunning shade of pink! I think that I need this! That's beautiful. I just have one Dior polish since I don't like spending that much on polishes but it's such a great one that I should look at them more. That's a pretty delicate pink! Ooh, the shimmer really makes this something special. Oh man, I'm loving this!!! I love the shimmer in it! So pretty! Really feeling shimmers lately! I love pink and gold together too! This is a pretty shade, not my kind of pink though. I've heard only good reviews about Dior, I wish I can test one sooner or later!